Well,after many months, I decided to attempt to write it and in the process of writing find out what has been so difficult. I could describe our backgrounds, education, experiences, goals, dreams, and maybe some of it would be interesting and relevant. I could write about Rob and Vidya separately or try to find the common ground and describe that, and after 27 years of living together that shouldn’t be so difficult! What is really relevant for the reader of the web site Costa Rica Mountain Property? Who are these people who are attempting to create a spiritual/yoga community somewhere in the mountains of Costa Rica and would you be interested in joining them? How much about them would you like to know? I was born in Belgrade, former Yugoslavia, attended school there until the age of 14, then lived in Indonesia with my parents for a couple of years. After the tropical experience we moved to West Germany where I attended German High school in Dortmund, followed by the Free University in West Berlin. While at the university, in the midst of the final exams in psychology, I felt strongly drawn to go to India. I traveled to Pune, to the ashram of Bhagawan Shree Rajneesh, today known as Osho, intending to stay just a short time, and basically never returned to my former life. The experiences I was having made me understand how invalid were the academic techniques of acquiring and evaluating knowledge. I could see that the whole of academia was based on some sort of reductionism: separating something big into its little component parts, and then deriving conclusions about how the "big something" really worked. The question of utmost importance then until today was/is ‘Who am I?’. My psychology studies were not able to even begin to touch upon the mystery. I was stunned by the effects of the meditations I practiced intensely for a period of a few years. I knew that I had tapped into something which was more important than anything else in my life: the state of silence which opened up during those meditations. It led to insight, wisdom, knowingness, happiness, centeredness, strength, compassion, and love. Everything I always wanted and tried to find in the academic world. The presence of Osho, an enlightened being, sitting with him every day in meditation for 5 years opened up vast universes. In March of 1981 I met my life partner, Rob who is also known as Punito. At that time the ashram in Pune was undergoing a huge change: Osho was leaving for the United States and so were many of his disciples. Rob and I decided to go to Berlin, Germany, and join Osho’s meditation community there. Our spiritual journey took us after a couple of years to Boston, and then to Oregon. We were part of the big experiment called Rajneeshpuram and were witness to it’s collapse. We returned to Boston with absolutely no money and no worry in our hearts. Taking care of survival issues was actually a celebration. Trust has been a permanent fellow traveler on our physical and spiritual journey. As I was trained to be a massage therapist and Rob could do any job in the world, from teaching physics, or English as a second language to building houses, carpentry or plumbing and electricity – we connected with the Insight Meditation community in Cambridge, and supported ourselves with respectively massage therapy and building work with zen monks. As the winters in Boston grew longer in our subjective impression we decided to move to Hawaii, to Maui. But only after a year it struck us that the physical beauty of Maui was not quite enough for us – we longed for a place that offered a challenge. We decided to move to Sydney, Australia, where Rob is from originally. After teaching high school in Australia for a few years, it became apparent that this was a path which would not provide answers to fundamental issues percolating away inside, already for many years. I kept having flashes of the future, myself fossilised as a trilobite at my desk. So in 1978 I left my career as a trilobite behind and hit the road, looking for answers and meandering slowly through South East Asia in the general direction of Pune, India. At that time this was a place of radical experimentation in humanistic psychotherapies of various kinds, an Indian ashram with an unusually large number of Westerners gathered around a charismatic guru who was its spiritual center, Osho. It felt like a good place to look for answers. And so it was. It was an intensely alive place of self discovery as well as meditative quiet. As an international intentional community it provided deliberate conditions for learning about oneself (and the dreaded Other), about common mechanisms of projection and the mechanical nature of unconscious behaviour. At the core lay the practice of meditation. Community experiences both large and small have been part of our lives for the last 30 years. These experiences have allowed us to pull together the practical and interpersonal skills needed for living together in community. Many of these simple skills have disappeared with the growth of our fractured and isolated Western lifestyles, and I have the feeling we will need to rediscover them in order to survive the coming times. Our lives as gypsies certainly provided ample opportunity to pick up some practical moveable skills, such as building and carpentry, and teaching English as a foreign language (always a useful standby for a gypsy). Additionally, continuing to explore the somatic and energetic realms of the human bodymind led to trainings in Massage, Cranio-sacral balancing, Reflexology and BodyTalk, completed in parallel with our travels. The practice of meditation has been a constant, and welcome, companion. After living and working in Sydney, Australia for some five years, we decided to take a break and visit India for a little vacation, and visit old friends. There we met with H.W.L.Poonja, also known as Papaji. This was a pivotal meeting, as the power and grace of the man rekindled the flame of desire to know the answer to the eternal question, 'Who am I?'. This attraction was so strong that we left Australia, rented a house in the city of Lucknow where Papaji lived, and attended his satsang every day - for the next five years. This period terminated with the death of Papaji, and we moved back to Germany for a while. 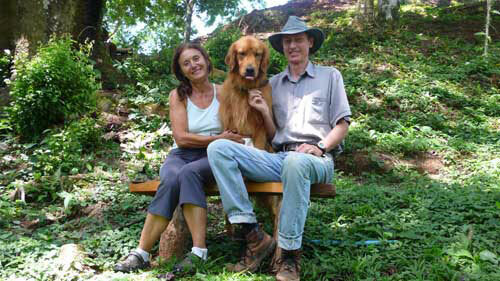 We came to Costa Rica in 1998, to begin a start-up business in the mountains. The focus of this effort was to create a space, both physical and energetic, to host individuals and groups in a yoga vacation/retreat setting. In a very real way this represented for both of us a challenge which engaged us on many levels. It brought together the various elements of our past experiences in meditation, therapy and the practicalities of working and living in community settings of a spiritual nature - only in this case all of it in a business context and with a business intent. The result was Pura Vida Yoga Retreat in Costa Rica, where we lived and worked for some 7 years.